Pelviva Pelpon - inserted like a tampon. The Pelviva Pelpon is an exercise device for your pelvic floor to help you retrain it so that you leak less urine, less often. Unlike ordinary bladder control pads, it doesn't absorb. Unlike Poise Impressa, it doesn't act to put pressure against the urethra to help stop leaks. It helps train the pelvic muscles and make them stronger using electronic muscle stimulation. Where did the brand name Pelviva Pelpon come from? The word 'viva' means 'alive' in Spanish. Women don't like to refer to incontinence, bladder weakness or urinary leakage. 'Pelvic floor' is used as 'code' for these words. Therefore, Pelviva is a combination of pelvic + alive. The word 'Pelpon' is derived from 'pelvic tampon'. Conventional pelvic floor simulators are difficult and inconvenient to use. Similar in size to a tampon (see sizing below). Some women said it felt very strong and uncomfortable at first, but after 3 or 4 pelpons, the pulses felt much more comfortable. It may be a bit like getting used to contact lenses. Each pelpon 'pulses' for 30-minutes with 10 seconds in a 'work' cycle and 10 seconds resting so a woman feels an on again, off again pulsing. It is turned on by activating a pull tab which delays the pulsing effect for 10 seconds while a woman inserts it. The intensity is gradually increased over the first few work cycles until a level is reached that produces an electrically induced contraction of the pelvic floor muscles. Each pelpon is single use and disposed of after the 30-minute treatment. This reduces issues with infection. 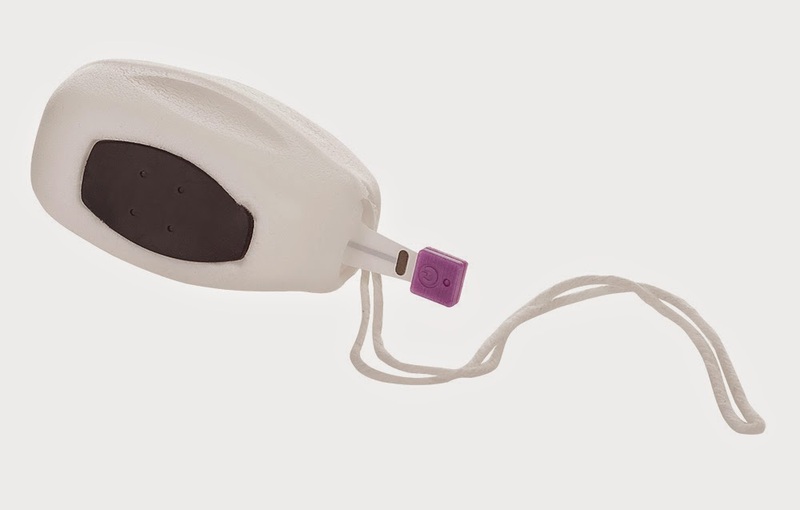 The electrode is made of soft, expandable foam that is comfortable to use during a variety of day to day tasks and is disposable. It can be worn sitting, standing, lying down or walking. Because its easier to use, the company believes women may be more likely to use it to the end of treatment. Manufactured by Femeda, Ltd, a UK company located at Long Marston nr York. Introduced into the UK market September 8, 2014 following a successful 30 woman user trial. Furter expansion is expected. They also conducted a clinical trial by Wellcome Research in 2010 with 123 women where 84% noticed an improvement in reductions and frequency (similar to Poise Impressa). Using one every other day can result in improvement within14 days. 18% of women as young as 25 admit they're worried about bladder leaks during exercise. New patent application filed with a publication date of October 1, 2014 - GB1414695.5. Pricing per pelpon ranges from $10.38 each (a 2-count sample pack) to $6.92 each in the 30-count pack. Discover your pelvic floor age - this is a name collection device disguised as a helpful tool. pelvicfloorage.com - discover the pelvic floor age calculator (really a name collection device). About the size of a super plus tampon after use. Comfortable to wear + proper muscle contact. How Long Does A Woman Use Pelviva? Based on the clinical trial, the company developed a two part program - training and maintenance. During training, its intended a woman use a pelpon every other day followed by 4 to 6 per month once they've strengthened their pelvic muscles. What's The Cost? If a woman started a 4-month training regimen on January 1 and followed the balance of the year in 'maintenance', she could expect to use 61 pelpons while 'training' and 35 for the balance of the year in 'maintenance'. That's a total of 96 pelpons at $6.92 each. Her year one expenditure would be $664 - worst case. The company says a woman spends $640 annually on pads, so if she could eliminate pads altogether, it would be a push. The company does not make claims that Pelviva is a pad replacement however. The consumer benefit is strengthening the pelvic floor muscles to help avoid using pads or as many of them. The year two cost might only be $50 to $80, depending on the woman and the amount of pelvic floor exercises she does. In summary, there needs to be more in-market experience to fully understand the benefits of Pelviva and how it affects a woman's purchase of pads. 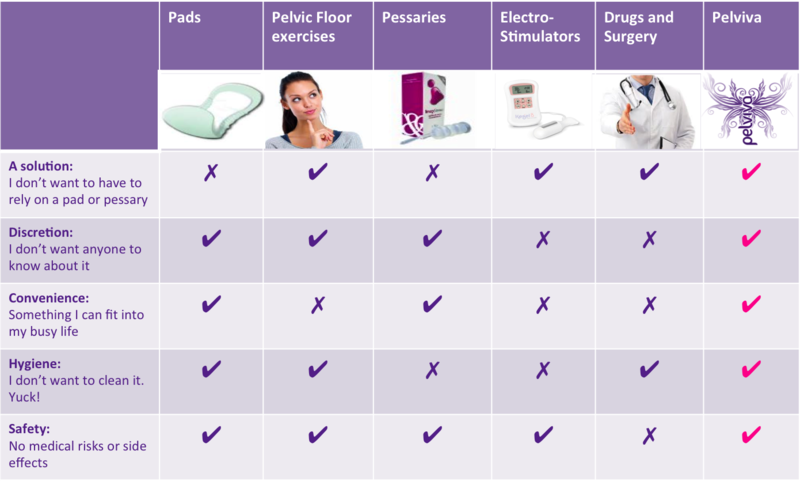 It seems clear that products like Pelviva, Poise Impressa and the Solace Bladder Control Balloon become popular over time, the bladder control pad segment will decline and this will affect Kimberly-Clark (Poise), SCA (TENA) and P&G (Always Discreet).